Every day I trawl through almost 250 web site feeds in order to write Lifehacker, and for the past 2 years I’ve used Bloglines to do so. No other feed reader (not even the one I helped build) had all the features I needed to track what I’d read and what I hadn’t across computers and operating systems. That is, until I gave Google Reader another whirl earlier this week. The just-rolled-out Reader upgrades turned the app into an even better product than the much older and more-established Bloglines, and so I’ve made the switch. The most interesting thing to me is that Gina’s reasons for switching were almost entirely different from my reasons. – an API like Bloglines has. Fair point. – Better favicon support and the ability to rearrange the order of feeds (one digg user wanted to be able to drag and drop feeds). Also fair points. – Disposable email addresses. This one wouldn’t have occurred to me. Readers mentioned dodgeit as an alternative for disposable email addresses, and that dodgeit can turn that email into an RSS feed. For example, if someone sends an email to funkymcfunk@dodgeit.com then anyone can read that email by subscribing to the RSS feed http://dodgeit.com/run/rss?mailbox=funkymcfunk . I never thought of this, but it’s a neat concept to avoid giving out your actual email address. – OPML import. This is supported (click Settings, then look for the Import/Export tab). One digg reader mentioned a problem with importing Netvibes OPML though. – Show only updated feeds. This is supported (in the left pane, there’s a link that toggles between “only list updated” and “list all”). – A mobile reader. A digg commenter mentions http://www.google.com/reader/m/ . Okay, I tried it and the mobile reader works well–it even shows tiny pictures on my phone if they’re in the post. Reader also somehow sent back the “Matt has read this post” info, so once I finish an item on my phone, it’s marked as read when I reload Reader in my desktop browser. That’s pretty cool, and now I yearn to upgrade my phone. – Automatic refresh. I don’t think Reader does this right now, although it doesn’t bug me to hit the Reload button. – Ability to sort items reverse-chronologically. Again, not the way that I read but it makes sense. – Better preservation of formatting when emailing posts from Reader. Other folks on the Lifehacker/digg threads mentioned Rojo, NewsAlloy, Netvibes, reBlog, and Mintr for their feed reading. After taking Google Reader for a 1.5 week test drive, I’ve now switched over to Reader completely. I found that Reader let me slice through the same number of feeds in less time, and that was the clincher for me. One hidden Reader gem I noticed today is that the search box for “Add subscription” is very smart. You can type in an exact RSS/Atom url, but you can also just type “www.lifehacker.com” and Reader will go and find the feed for you. That’s cool, but Bloglines can do that much. Today I realized that if you type a query, Reader will suggest feeds. If you’re using Reader, try searching for a feed by name. You can also use the “Subscribe as you surf” bookmarklet (click Settings, then look for the Goodies tab), but I like adding feeds by name. Thanks Matt. I was procrastinating on switching over from Bloglines but I think it might be time to give it a test drive. Based on your previous posts (and the one cited from LifeHacker as well), I just imported my opml into Google Reader and am giving it a try for a week. I agree that they have made tremendous progress with this version, and are much closer to what users are wanting from an RSS reader. My one complaint (or desired feature) from Bloglines that I miss in GR is (and I have not seen this mentioned elsewhere) is the ability to view articles by feed within a category. In Bloglines, if I have 10 blogs grouped under “Technology” and I click on the “Technology” link, I will be shown all of the new posts from these blogs, separated by their individual feed. With Google Reader, it seems that if I would click on “Technology”, I am just shown the most recent posts, in chronological order. Posts from different feeds are interspersed, and the title of the feed is in a smaller font than the title of the post (making it harder to discern the name of the feed). Sometimes there is continuity and connections between adjacent posts of a specific feed. You lose this when you throw all of the new posts from a specific feed together. (And I know that I can click on specific feeds, but its too much work). Hey Matt, nice post. I switched because of Gina’s post, and after one day I think I’m in love. However, I think it does auto update. I was reading one set of tags and another one appeared above it. I like your spam protection, very original. Have to agree that the new reader is really fantastic. Well done Google. One pet dislike is that I don’t have an option to be taken straight to my reading list when I login. Only 1 extra click but still annoying. I still prefer a desktop RSS Reader(I use Liferea). One problem I found with the new Google Reader is that you cannot change a feed URL once it is set. You will have to delete and re-subscribe. As for the Google search box that supports a variety of input, it’s always a sign of quality. Sometimes I see web forms which get a hiccup depending on whether or not you enter “http://” in front of a URL (or explain to you the exact format things need to be entered)… I think that’s wasting the user’s time by saving the programmer time, but it should always be the other way round. I started using Google Reader about 3 weeks ago since i finally wanted to start using feed readers. I am still a little puzzeled: where is the search function which i can use to search through all posts that i ever read in it? I like the Google Reader — but the missing refresh is making me crazy. You can’t even use F5 to force one, you have re-click the bookmark (or whatever you use). I’ve noticed the “r” refresh sometimes just doesn’t cut it and either mentions that things are new (but doesn’t show them) or misses things that magically appear when I re-load the page. Even gmail refreshes automatically 😀 (and strange enough, sometimes the Google Reader shows some signs of wanting to refresh but usually doesn’t get it right). Hey, you’re right Sebastian: no search in Google Reader?! I figured that search functionality would be a given, oh well, v3. The ‘add subscription’ search actually does this: http://www.google.com/reader/directory/search?q=yahoo+yodel , but it only works if you’re logged in. Wouldn’t it be a good idea to expose that terrific search capability on the normal (not logged in) search pages (and certainly the Blog Search pages)? 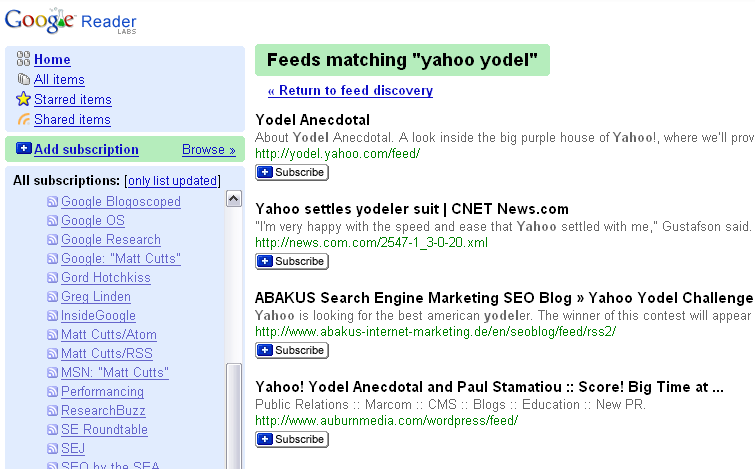 Say [feed:yahoo yodel] ? You’d have decisions to make about subscription buttons, and about making the actual feed URLs clickable, but those are just details. How’s it going, with regard to spam prevention and time/hassle required? I used it when traveling Thursday and Friday to keep up with things while away from my software-based tool, and it was fantastic. But Matt — unless I missed it, there’s no ability to search for posts that Reader has collected for you. Big oversight from a search company. I have an ‘untitled’ feed stuck in Google Reader. Can’t rename it and can’t delete it. I tried Google Groups for support but have got no help yet. Any ideas on how to force remove a feed or get help? I guess google does rock, It looks swell! The auto-refresh is the only thing that’s driving me nuts about it… other than that, I love it. You might also be interested in taking a look at this page that members of Google Groups Reader are putting together for suggested improvements. The single biggest reason stopping me is no manual ordering of feeds in a folder. I use the order to decide which to read first. Sebastian and Danny, I agree that I haven’t seen this and it’s a good feature request. But what I do is run Google Desktop to make every page I’ve browsed be searchable. Thomas, you could export into OPML, edit the file, clear your subscriptions, and then reimport, maybe? am I the only one who needs to search his feeds? Cool feature, Matt. And thanks for the Yodel Anecdotal plug. Next year you’ll have to catch our Hack Day event in person (we’re already fantasizing about who can match Beck). Can you get in touch with at mihaip at google dot com so we can debug this futher? I swtiched over from MyYahoo! to Google Reader yesterday and wrote a long rant about it WebMetrcisGuru.com I like the new Google Reader and am getting used to all it’s new fucntionality. I was most pissed at Yahoo and MyYahoo! for not making it easier to switch over – all Yahoo seems to care about is eyeballs and money. Thats cool but all new features of google reader was implemented in News Alloy almost 6 months ago, and Google reader just got the idea (i know what i’m saying new GR took 80% of new features from News Alloy). have you ever tried News Alloy Mobile ? First – I loved Google Reader when it first came out, used it as my primary news reader.. But this new version is even better! In regards to refresh – I’ve noticed that the updated subscriptions count on the left side of Reader automatically refreshes with new posts.. For example, if I have a few hundred posts to read, and i sit and go through them one by one (it may take a half hour or so) by the time i’ve gone through every single post (and marked them all as read) I’ve noticed that the Updated Subscriptions Count will always have one or two posts still marked as unread. When i click go to directly to those posts, those posts usually occured within the last few minutes… So refresh IS there.. Not 100% apparent though.. The new post does not automatically show up on the right side. Two things that bug me about the new reader – one as Richard said – I hate being taken right to “Home” there should be an option to set reader to automatically take you to “All Items” when you type in reader.google.com… As he said, its only one extra click, but still annoying. Second – the All Items unread Item count – why can’t it count more than 100?? If the Updated Subscriptions is able to count all the un-read posts, why cant the All Items unread item count more than 100?? I’ve been trying Reader out as a Bloglines replacement since its upgrade, and have been pretty pleased with it. The only real problem is that I get beachballed in Firefox and Safari all the time, so it slows me down quite a bit. Great stuff, thanks Matt. I’ll give it a try (I’m currently using bloglines) now! We also did a post on Google Reader. For me, it works well regardless of what device I’m using. One annoyance not mentioned is the Subscribe toolbar button. I don’t like the two step process of having to again hit the Subscribe button to accept the feed. I wonder if it wouldn’t be easier to use the reverse process. In other words, if I use that toolbar Goodie and click Subscribe, I am fully subscribed. If I don’t want that feed, then I hit an Unsubscribe button. It just seems to me that if someone already clicked the button, their intent was to keep the feed. One question I didn’t ask is how does Google go about creating the bundles? I would love to be able to create custom ones and offer them to readers as it might be easier than explaining OPML. I do love the new Reader too, but I want to mention also some minor points too. 1) Refreshing is often very slown. I’ve used Google Reader for a long time: the mobile version is especially good on a Blackberry, by the way. I’ve used that for quite a while; a great way to while away time while on the move. Very neat. * Allow me to mark all items in all feeds as read with one click. Once I’m done reading blogs I like to leave a clean slate, so that next time I read my feeds I only see the new posts. * Sort the feeds on the left-hand side by attention order. Put the feeds I read the most at the top of the feed list. I recently switched over to Google Reader after the recent upgrade. I must say that I really enjoy the interface. It makes it very easy to get through many different RSS feeds. I also like the integrated blog search feature. Here’s the kicker for me. Many non-web-savvy people use bloglines (and myyahoo). Bloglines exports to a web address and you actually have to create a file, paste in the info, save as OPML and then you’ll import it into Google Reader. Would it be that difficult to be able to either 1-take that url and let the GReader do the work or 2-make it simple-stupid in the FAQ and not just link to Bloglines 2 lines of explanation? I am still not sold on Google Reader, Sage for Firefox is just so darn nice, it also has smart search to find feeds and exists outside of Google. I love the Google reader but would love to be able to import my Bloglines and also have the RSS feed on my blog. I treaded slowly at first. Added a few of my blogs. IN about 3 days, I moved my entire Bloglines subscriptions. A couple days after that, I became an evangelist. Reader really is a lot better than Bloglines. If nothing else, its a lot more pleasing to the eye. It has amjor problem for me. I update my own feed daily, and all other readers display it with no difficulty. But G Reader puts the publishing date two months in the past, so the new updates are pushed *completely off the page view*. This has been the case since the beta launch, despite me selecting the ‘Neweset first’ option. Am I missing something with the keyboard support? In Blogliness I cruise through a 100 feedback using the ‘j’ key to go through a feed and the ‘s’ key to go to the next feed. In Reader I can space through a feed, but to go to the next one it’s SHIFT-n and then SHIFT-o. Not cool (or efficient). Major apologies. The OPML export from Bloglines went beautifully. I simply clicked to open the link, saved to my desktop and then uploaded to reader. Gorgeous. Google Reader does not read dates properly in an Atom feed. Instead of respecting the ‘updated’ tags on each entry, it gives each entry a mysterious date within the last few days — even if they are months old. I have a feeling that Google is overriding the date set by the author in favour of the modified date on the cached copy of the target webpage. If so, this is entirely the wrong way to handle a feed. One cannot and should not assume that the date the file at the target URL was last written is the date the entry changed. There are all sorts of reasons to rewrite that file that have nothing to do with the actual content. This messes up all the sorting and makes it impossible for me to look at some Atom feeds in chronological order. See the feed at my website (linked through my name) for an example of this bug. otherwise appears new to Reader, then you’ll see it at the top. happen for specific feeds, then report it to us. I’m afraid I must object to this philosophy in the strongest possible terms. The dates that are inside feeds are to be respected, by specification. If the dates listed inside a feed are incorrect, then that’s the feed producer’s problem to fix. If Google decides to second-guess the feed author and apply its own dates, there are unintended consequences, especially for brand new feeds. I just started publishing a feed, and Google decided to ignore my dates and apply its own. The problem is that there is no logic to the dates Google chose. They don’t sequence the same way as the dates inside the feed, nor do they sequence the same way as the appearance of entries in the feed. As a result, the entry listed as ‘most recent’ is over a year old, and the actual most recent entry appears near the bottom of the list. What is even worse is that there is absolutely nothing that I can do to correct this situation, because the tools given me by the Atom specification to specify dates have been deactivated and ignored. Those historical entries that were added all at once will always be incorrectly sorted with entries appearing ‘more recent’ than other entries that were written more than a year later. This is the problem when aggregator developers ignore the specifications and try the ‘fix’ broken or inaccurate feeds by second-guessing the authors. You end up breaking the ability to specify anything accurately, rendering part of the feed specification irrelevant, and taking control out of the hands of the people who most properly and efficiently should have that control: those who are closest to the data. Please respect the dates in feeds as laid out in the specification. I just started using Google Reader and I am sold on it. I haven’t been using readers much, but the ease of use and the convenience of being able to access it as well as my other tools is really nifty. Everything is a give and take, I’m happy! If this is in the google reader, I’m missing it.